My fraternity is just about to enter election season and we’re looking for a new election process. Normally, we nominate candidates a week before elections, and on election day we give them two minutes to give a speech, and after all candidates for any given position have spoken (ex. President, VP Recruitment, etc. ), we have a 3 minute discussion about all the candidates overall. This 3 minute discussion is where the problem lies. It usually turns into a symposium of people pointing out the flaws in candidates who they don’t feel would be a great fit. How can we fix this discussion process? I hate the open forum because of what you state – it turns into a crap-talking session. Everyone knows the candidates flaws already meaning there is no value in having it in the open. 3 pros and 3 cons is the same thing. Never criticize any brother in public. Nothing good can come of this. In my opinion – you should have speeches one week and then the election the next week. This gives the brothers an opportunity to talk about candidates in private. It also gives the candidates an opportunity to talk to the brothers about their plan and answer any questions that might be out there. I am running for president of my chapter and they want new ideas for the position. What type of ideas would be impressive to you? Talk about an open-ended question…. Believe it or not I have written a campaign for fraternity president. 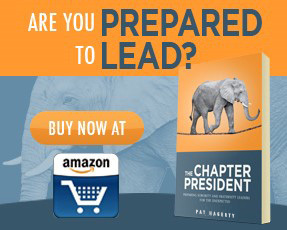 It is published in my book The Fraternity Leader along with advice on how to get elected. Solve these problems and any others the brothers may have and that will be the key to getting elected. How can I become the Historian on my fraternity’s e-board? A friend of mine (and roommate) and I are both for sure running for the position. I think I’m the best man for the job. I’m very passionate about my fraternity’s history, and I would love to be in charge of continuing to record our history. The problem is that I have never held a leadership position. So I haven’t been able to prove myself. This is typically a pretty defined role in each chapter. That makes getting elected easier for you since you know exactly what is expected. The key to getting elected is in the ‘how’. HOW are you going to record your chapter’s history? You need to develop a tangible plan that will tell the brothers exactly what you will do. That is the key. Don’t worry about the other candidates in your election. Your job is to focus on giving a clear explanation of what you can offer. It isn’t your job to point out the flaws in your opponent. This isn’t made-for-tv politics. Remember your opponent is your brother and will remain so after one of you is elected. Take the high road to make sure you don’t damage any relationships. Good luck to all those running for office.